Penumbral Lunar Eclipse on February 11, 2017. 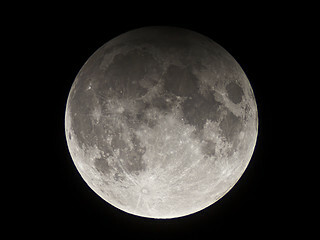 Image taken at maximum eclipse at 00:44 UT, when 98,8% of the Lunar Diameter has immersed into the Eath's penumbral shadow. 1/350 second exposure, taken with a Canon EOS 550D at ISO 400 on a 90/1000mm achromatic refractor telescope, trough a thin layer of high clouds.